Tennis game is easy to understand and its mechanics for scoring is based on the number of missed shot by the player inside the court line, when you need a formal document for the recording of points, tennis score sheet , Canasta Score Sheet Template can give you a hand in this job. The recording tool that can have write down of all sets or the seven points earned by the player and be able to amend a tiebreak if happens. 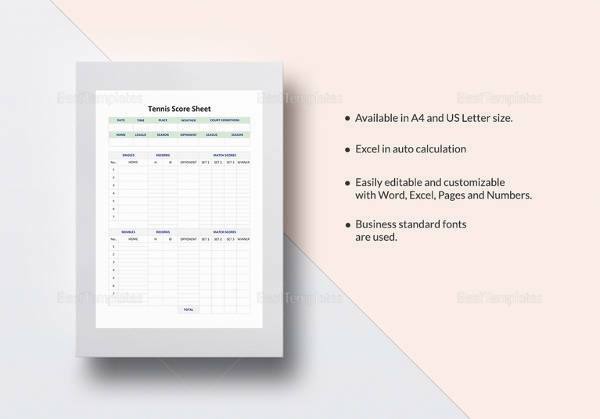 The example format can be seen online and you can download the sample format for free or at Microsoft word or excel, so you can print the score sheet before the tennis game starts. 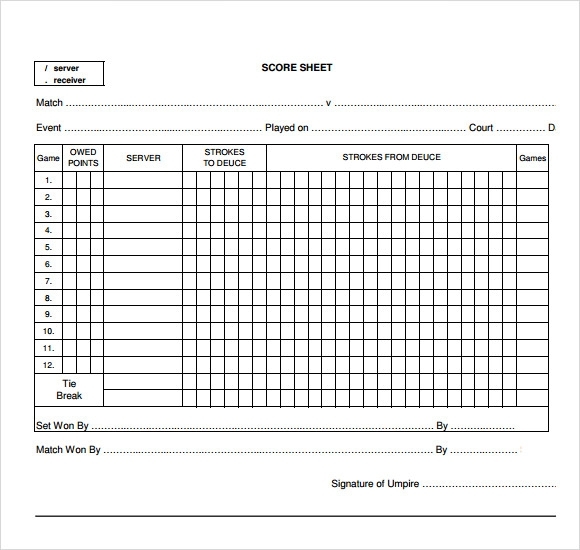 Tennis score sheet will make the player knows the score needed if they are in the losing part or if they are near to a set. The tennis score sheet PDF template is very easy to download. 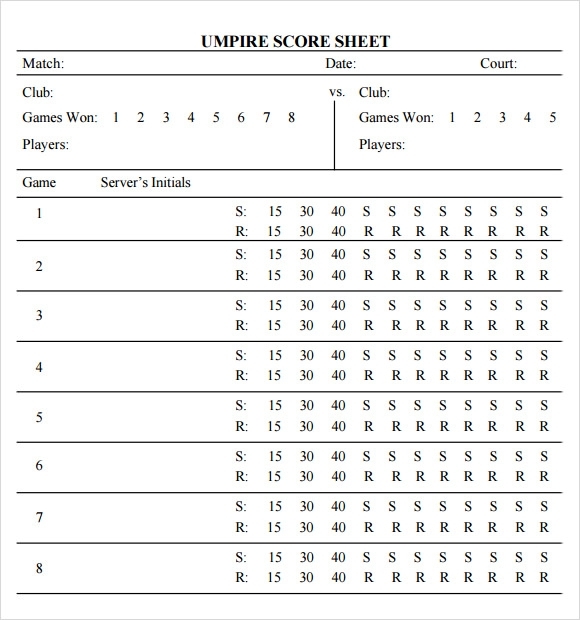 It provides you with the umpire score sheet which depicts all relevant information in it for keeping the record of score while playing the game. Information like match, date, court is showcased in the score sheet along with the table for recording scores. 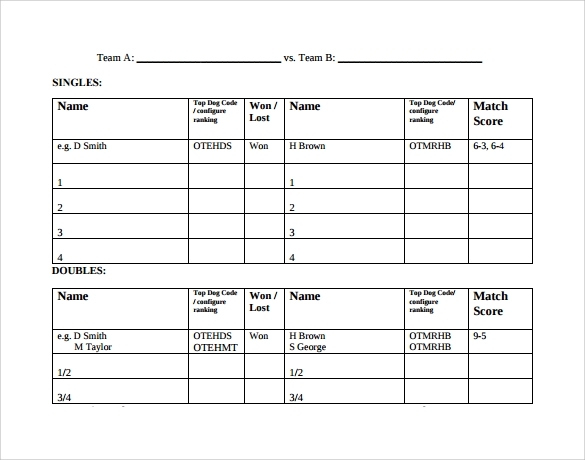 The tennis score sheet free template provides you with the official score sheet for keeping the record of scores. It depicts the information like name of home team, away team, division, current location and date. Along with the table for writing the scores, special space for writing the results is also provided in it. The tennis score sheet printable, as the name suggests is ready to use template. You can simply download, print and use it. Designated spaces are given in it for filling the information asked like name of both teams, name of winning team, date and more. A separate table for singles and doubles tennis games are also provided. 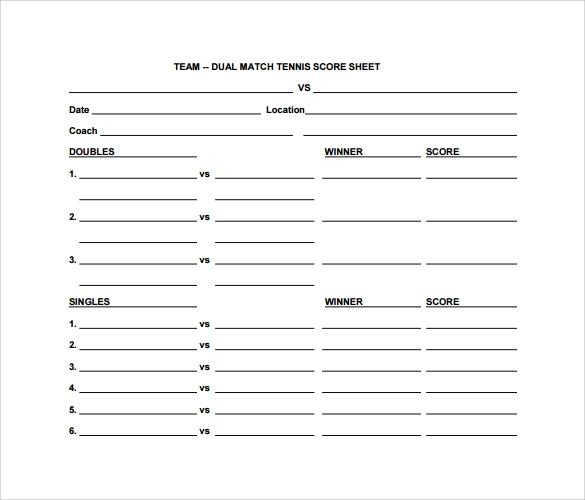 The dual match tennis score sheet provides you with the score sheet which is specially designed for recording the scores of dual matches. It features information like date, location, name of teams and more which are really important to mention. Also, the space for writing scores is provided in both i.e. singles and doubles separately. Why is the Tennis Score Sheet Template Needed? 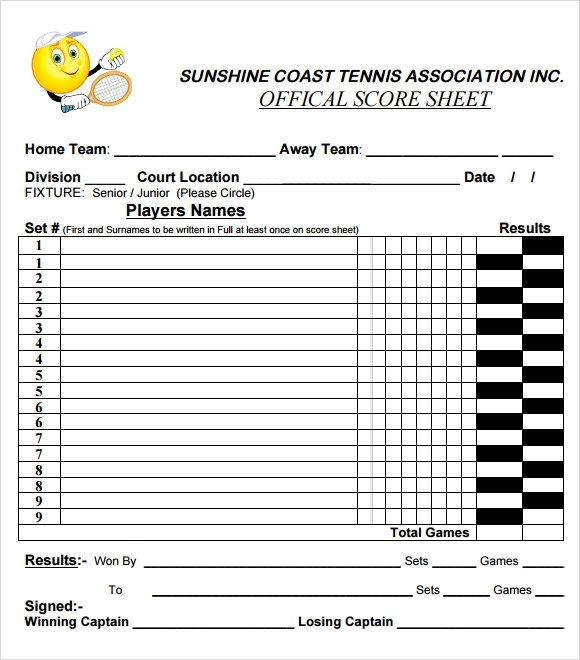 The tennis score sheet template is needed for recording the scores of both players and both teams while they are playing the game. Correct recording of scores is very important so that the game may remain fair for all and the deserving participant gets to win the game. All templates are designed properly and have separated columns for writing the scores which make it really easy to record them as you are just needed to write the score after every round. This template is needed to save the time also as you get the readymade format in it in which you only need to fill in the information asked. When is the Tennis Score Sheet Template Needed? There are various benefits of tennis score sheet template like it makes the recording of scores immensely easy for you by providing you with ready to use formats. All information is already provided in them and therefore, it saves your time also. These templates are also reusable which means you can use a single template for various times i.e. whenever you need to record the scores while playing tennis. 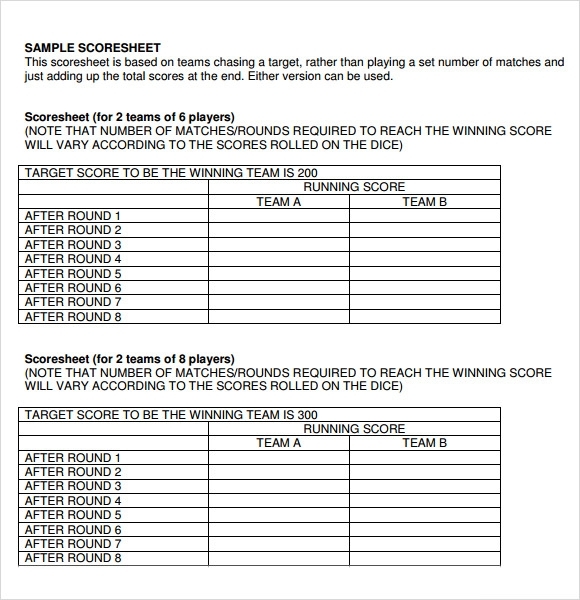 Long with all this, these templates help you in deciding the real winner by helping you in recording scores of all rounds correctly. 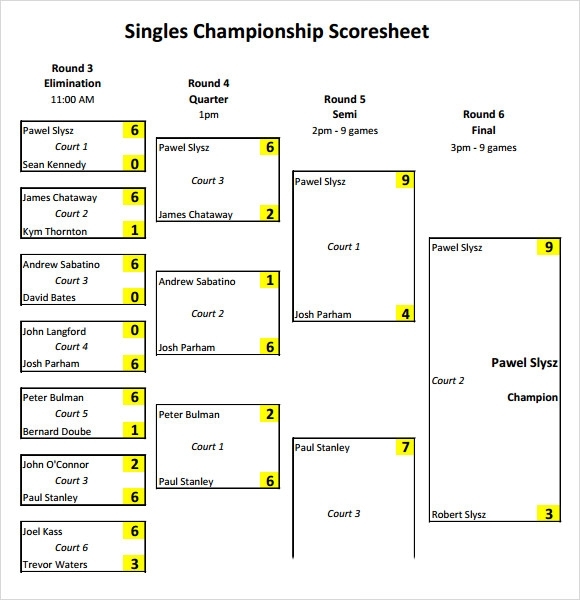 The tennis score sheet template is very easy to download and use. There is a variety of designs available in it to choose from so that you get the one the best suits your requirements without any hassle. Along with all this, these templates proves to be really helpful in recording the scores while playing by providing you with well framed tables.